Earth day is a time to share with your child the simple actions we make every day do to care for our Earth. 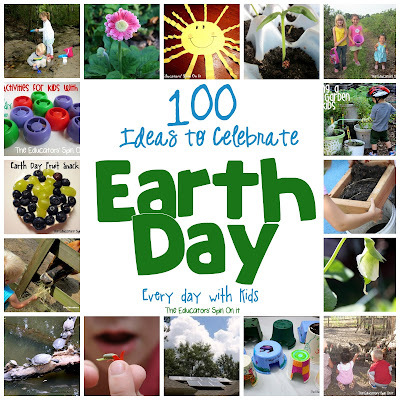 Here are some ways to celebrate Earth Day with your child. 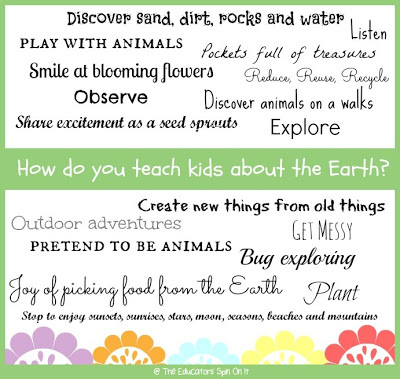 How do you teach your child about the Earth? We encourage you to start at an early age by teaching your child about the earth and how to love and protect it. Simply things like including your child in recycling daily items, planting a garden together, and observing things together on neighborhood walks can make a difference in how they learn to value our World. Teaching our children about living green can start with simple steps at a very young age. Creating fun art projects together with reused objects and even creating a few fun games with recycled lids and/or containers can encourage your child to see all the uses for an item, not just one and reducing waste. Don’t forget to talk about why you’re using the things you use to be more eco friendly. It’s so much fun to celebrate Earth Day with a playdate with friends or outdoor lunch at school. You could plant some plants together or clear a neglected public area together. Grab a few fun books and include a special Earth Day snack. Better yet you could host your own Picnic for the Planet! We’ve created a roundup of some of our favorite Earth Day Activities, Crafts, Games, Books and Snacks for you to plan your own Earth Day Celebration that will last all year long! Celebrating earth Day with your child is something you do need to pause and be sure to really discuss. Reach out into your community and see how your family can make a difference for our environment. You’ll be so happy you did. Let us know your idea on how you connect. How will you encourage your family to create Earth Day every day at your house? « YOGA: A Step-by-Step Guide to have your Family Moving, Laughing, and Storytelling Together! This is so fabulous! I really need ideas for Earth Day! Thanks! Will share it. I love all these Earth Day activities. I would like to invite you to link up this post on my Money Saving Monday Link Up. My Family-Focused Monday hop is live now and I would love to see one of your awesome posts linked up @ http://www.mondaykidcorner.blogspot.com. Thank you so much for sharing! This is definitely going to be my go-to list of Earth Day activities!